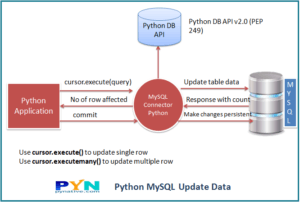 This article demonstrates how to issue a MySQL UPDATE query from python to update MySQL database table’s data. After reading this article you can do the following MySQL update operations using Python. Update single row, multiple rows, single column, and multiple columns. Use a python variable in a parameterized query to update table rows. Also, understand the role of commit and rollback in the update operation. MySQL database table name which you want to update. For this article, I am using computers table present in my MySQL server. Note: We are using MySQL Connector Python to update MySQL table. Let’s see the program now. In this program, we are updating a “computer” table by changing the value of ram column of the computer whose id is 1.
sql_select_query = """select * from computers where id = 1"""
sql_update_query = """Update computers set ram = 10 where id = 1"""
Then we prepared SQL UPDATE query to update a “ram” column of a computer table. Update query contains the column value to be updated. we used a connection.cursor() function to get cursor object from the connection. this method creates a new MySQLCursor object. using a cursor.execute() we can execute the operation stored in the UPDATE query. Make changes persistent into a database using connection.commit(). After a successful update operation, use a cursor.rowcount method to get the number of rows affected. here it will return 1 because we are updating one row. Sometimes we need input from the user, for an example when user updating their password or any other details through User Interface. It is always best practice to use parametrized query and prepared statement i.e. placeholders ( %s ) inside any SQL statements that contain input from users. This helps us prevent SQL injection and other SQL issues. Let’ s see the example program now. sql_update_query = """Update computers set ram = %s where id = %s"""
We then added those two columns value in the input tuple in sequential order and passed SQL update query and input tuple t0 cursor.execute() function, remember tuple contain user data in sequential order of placeholders. It is possible to update multiple rows in a single SQL Query. I have prepared an example which demonstrates the same. you can also call it a bulk update. We can use a cursor.executemany() method of cursor object to update multiple tables rows. 2 Records Updated successfully into computers table. cursor = connection.cursor(prepared=True) function allows a prepared statement to execute a SQL query. We defined a SQL update query with two placeholders (“ram” and “Id” column ). and prepared List of records to be updated. this List contains tuple for each row. here we created two tuples so we are updated two rows. We used the cursor.executemany()function to update multiple rows of a database table. using cursor.rowcount we can find how many rows are actually updated successfully. This method prepares a database operation (i.e. query or command) and executes it against all parameter sequences in the sequence “seq_of_params” argument. We can also update multiple columns of MySQL table in a single query. prepare a parameterized query using a placeholder to update multiple columns. let see this with an example program. sql_update_query = """Update computers set name = %s, ram = %s processor = %s where id = %s"""
# close the cursor and connection object. Suppose you have a date column in a MySQL table and you want to update a datetime.datetime() object into this column. then how to prepare an update query to update the datetime column of a table. let’s see this with an example. sql_update_query = """Update computers set purchased_date = %s where id = %s"""
You should get the following output after execution of the above code. Murugan, try removing prepared=True from cursor creation.